President Bieto, Dean Sauquet, members of the faculty, distinguished guests, and ladies and gentlemen….Thank you for the kind introduction. I’m honored to be at a university noted for knowledge, and in a city with 2000 years of history – home of Gaudí one of the 20th century’s greatest innovators. I’d like to start with a request. Everyone, hold your phone up in the air like this. Now look around. In this sea of phones do you see any Blackberries? How about any Nokia phones? Ok you can put your phones down now but let’s keep exploring this a bit. Raise your hand if you rented a VHS tape last night? Or if you used a paper map to find your way here? These questions and your answers lie at the heart of what I’d like to talk about with you today: the changing face of innovation and your role in it. Let’s start with Joseph Schumpter. I’m sure many of you have heard his name. Schumpter was an economist who taught at Harvard in the 1930’s and 40’s. I like the guy because he’s credited with coining the word entrepreneur. But you probably remember him as the one who proposed the theory of creative destruction. According to Schumpter, capitalism is an evolutionary process where new industries and new companies continually emerge to knock out the old. Fifty years later another Harvard professor, Clayton Christensen, developed his theory of disruptive innovation, which actually described how creative destruction worked. Disruptive innovation leads to the creative destruction of businesses that once seemed pre-eminent and secure. Which brings me back to your mobile phones. Think about this; 7 years ago Nokia owned 50% of the handset market. Apple owned 0%. In fact, it was only 7 years ago that Apple shipped its first iPhone and Google introduced its Android operating system. Fast-forward to today—Apple is the most profitable Smartphone company in the world and in Spain Android commands a market share of more than 90%. And Nokia? Its worldwide market share of Smartphones has dwindled to 5%. You’re witnessing creative destruction and disruptive innovation at work. It’s the paradox of progress in a capitalist economy. So congratulations graduates – as you move forward in your careers, you’ll be face to face with innovation that’s relentless. And that’s what I’d like to talk about today—how innovation will shape the business world of the next 50 years—and what it means for you. 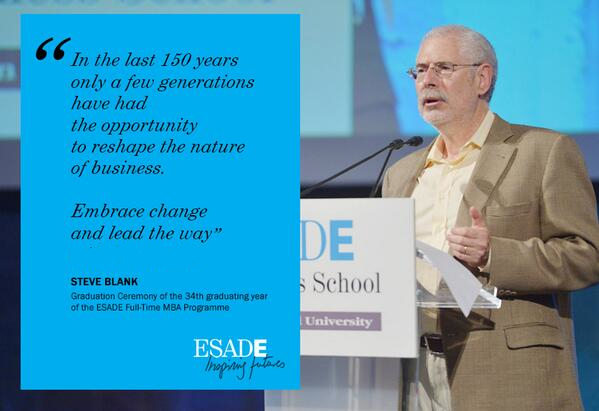 Your time at ESADE has trained you to become a global business leader. But the world you lead will be much different from the one your professors knew or your predecessors managed. Just look at the disruptive challenges that businesses face today– globalization, China as a manufacturer, China as a consumer, the Internet, and a steady stream of new startups. Today’s workforce has radically different expectations, brands are losing their power, physical channels are being destroyed by virtual ones, market share is less important than market creation, and software is eating world. Industries that we all grew up with, industries that enjoyed decades of market dominance – like newspapers, bookstores, video rentals, personal computers — are being swept away. The convergence of digital trends along with the rise of China and globalization has upended the rules for almost every business in every corner of the globe. It’s worth noting that everything from the Internet, to electric cars, genomic sequencing, mobile apps, and social media — were pioneered by startups, not existing companies. Perhaps that’s because where established companies might see risks or threats, startups see opportunity. As the venture capital business has come roaring back in the last 5 years, startups are awash in available capital. As a consequence, existing companies confront a tidal wave of competitors 100 times what they saw 25 years ago. Yet in the face of all this change, traditional firms continue to embrace a management ethos that values efficiency over innovation. Companies horde cash and squeeze the most revenue and margin from the money they use. Instead of measuring success in dollars of profit, …firms focus on measuring capital efficiency. Metrics like Return on Net Assets, Return on Capital and Internal Rate of Return are the guiding stars of the board and CEO. Cheered on by finance professors, Wall Street analysts, investors and hedge funds, companies have learned how to make metrics like Internal Rate of Return look great by one; outsourcing everything, two, getting assets off their balance sheet, and three only investing in things that pay off fast. As Harvard professor Clayton Christensen noted, these efficiency metrics provided wise guidance for times when capital was scarce and raising money was hard. But they have also stacked the deck against investment in long-term innovation. Since the financial crisis of 2008, policy makers have kept interest rates at near zero, flooding the market with cheap money in an attempt to restart growth. In spite of this, private equity funds have used the rallying cry of efficiency to hijack corporate strategy and loot the profits that historically would have been reinvested into research and development and new products. We legalized robbing the corporate treasury. Today billions of dollars that companies could have invested in innovation are sitting in the hands of private equity funds. Unfortunately as we’ve learned from recent experience, using Return on Net Assets and IRR as proxies for efficiency and execution won’t save a company when their industry encounters creative disruption. Ask Sony about Samsung, ask any retailer about Amazon, any car company about Tesla, and any newspaper company about the web. The stock market clearly values companies that can deliver disruptive innovation. Look at the valuations of companies like Tesla, Illumina, and Twitter. In fact, I predict that over the next few decades, we will see two classes of public companies. The first will be commodity businesses that are valued for their ability to execute their current business model. Their lifetime as a market leader will be measured in years. The second class will be firms with a demonstrated ability to continually innovate and reinvent their business models. The companies that can show “startup-like” growth rates of 50% plus per year will get stratospheric market valuations. The first type of corporate innovation is individual initiative. It’s exactly as it sounds – you build a corporate culture where anyone can suggest an idea and start a project. Some companies use a suggestion box, others like Google give employees 20% of their time to work on their own projects. The second type of business innovation is called process improvement. This is the kind most of us are familiar with. Car companies introduce new models each year, running shoes grow ever lighter and more flexible, Coca-Cola offers a new version of Coke. Smart companies are always looking to make their current products better – and there are many ways to do this. For example they can reduce component cost, introduce a line extension or create new versions of the existing product. These innovations do not require change in a company’s existing business model. This is what companies typically do to secure and defend their core business. The third type of business innovation – continuous innovation – is much harder. Continuous innovation builds on a strength of the company’s current business model but requires that new elements be created. For example, Coke added snack foods, which could be distributed through its existing distribution channels. The Amazon Kindle played on Amazon’s strengths as a distributor of content but required developing expertise in electronics and manufacturing. Fourth and finally is disruptive innovation – this is the innovation we associate with startups. This type of innovation creates new products or new services that did not exist before. It’s the automobile in the 1910’s, radio in the 1920’s, television in the 1950’s, the integrated circuit in the 1960’s, the fax machine in the 1970’s, personal computers in the 1980’s, the Internet in the 1990’s, and the Smartphone, human genome sequencing, and even fracking in this decade. These innovations are exactly what Schumpter and Christensen were talking about. They create new industries and destroy existing ones. And interestingly, in spite of all their resources, large companies are responsible for very, very few disruptive innovations. The first two types of innovation—individual and process innovation– are what goodcompanies do well. The third type—continuous innovation—is a hallmark of great companies like GE and Procter and Gamble. But the fourth type of innovation – creating disruptive innovation– and doing it on a repeatable basis– is whatextraordinary companies do. Apple with the iPod, iPhone and iPad; Amazon with Amazon Web Services and Kindle; Toyota with the Prius… these companies are extraordinary because, …like startups, they create entirely new products and services. ESADE and other great business schools have provided decades of advice and strategy for the first three types of innovation. But leading an existing firm to innovate like a startup is not business as usual. Paradoxically, in spite of the seemingly endless resources, innovation inside of an existing company is much harder than inside a startup. That’s because existing companies face a conundrum: Every policy and procedure that makes them efficient execution machines stifles innovation. Think about this. When it comes to innovation, public companies have two strikes against them. First the markets favor capital efficiency over R&D. And secondly, their sole purpose is to focus resources on the executionof their business model. As a consequence, companies are optimized for execution over innovation. And to keep executing large organizations hire employees with a range of skills and competencies. To manage these employees companies create metrics to control, measure and reward execution. But remember—in public companies financial metrics take precedence. As a result, staff functions and business units develop their own performance indicators and processes to ensure that every part of the organization marches in lock step to the corporate numbers. These Key Performance Indicators and processes are what make a company efficient —but they are also the root cause of its inability to be agile and innovative. Every time another execution process is added, corporate innovation dies a little more. So how does a company act like a startup in search of new business models while still continuing to successfully execute? First, management must understand that innovation happens not by exception but is integral to all parts of the firm. If they don’t, then the management team has simply become caretakers of the founders’ legacy. This never ends well. Second and maybe the most difficult is the recognition that innovation is chaotic, messy and uncertain. Not everything will work out, but failure in innovation is not cause for firing but for learning. Managers need radically different tools to control and measure innovation. A company needs innovation policies, innovation processes andinnovation incentives to match those it already has for execution. These will enable firms to embrace innovation by design not by exception. Third, smart companies manage an innovation portfolio where they can pursue potential disruption in a variety of ways. To build innovation internally companies can adopt the practices of startups and accelerators. To buy innovation companies can buy intellectual property, acquire great teams, buy-out another company’s product line or even buy entire companies. And if they’re particularly challenged in a market they can acquire and integrate disruptive innovation. My favorite example is Exxon’s $35 billion purchase of XTO Energy in large part to get their fracking expertise. Other smart companies are learning how to use Open Innovation pioneered by Henry Chesbrough who teaches here at EDADE. They can partner with suppliers, co-create with consumers, open-source key technologies, open their application programming interfaces, or run open incubators for customer ideas. Everything I’ve been talking about smart companies have already figured out. Many firms are creating the new role of Chief Innovation Officer to lead and manage these innovation activities. Ultimately this is not just another staff function. The Chief Innovation Officer is a c-level executive who runs the company’s entire innovation portfolio and oversees the integration of innovation metrics and initiatives across the entire organization. Looking forward, all of you will play a role in the future of business innovation, whether you help to accelerate it or discourage it. How can you kill innovation? Some companies have so lost the DNA for innovation they become “rent seekers”. Rent seekers fight to keep the status quo. Instead of offering better products or superior service, rent seekers hire lawyers and lobbyists to influence politicians to pass laws that block competition. The bad news here is that countries where bribes and corruption are the cost of doing business or that are dominated by organized interest groups, tend to be the economic losers. And as rent-seeking becomes more attractive than innovation, the economy falls into decline. I know that’s not the path most of you want to take. Instead I think you want to be part of the innovation team. And if you do you are in luck. Companies need your help. They need your help in creating new metrics to manage measure disruptive innovation. They need your help in creating new innovation incentive systems thatreward creative innovation. And they need your help as leaders who can run companies that can both executeand innovate. A pessimist sees danger in every opportunity but an optimist.. an optimist sees opportunity in every danger. In the last 150 years only a few generations have had the opportunity to reshape the nature of business. Embrace change and lead the way.